This edition of sewing on sunday is all about pretty. No other relevant theme other than they make me happy. :) As always, click the photo for the link. 1. 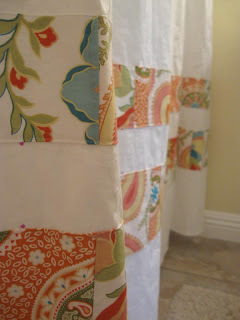 This is an amazing way to showcase cute fabric and a monogram. Looks like it would take a lot of patience, but totally worth it! 2. This mobile is amazing. 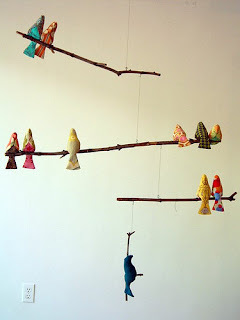 I'm thinking this is a mobile worth putting outside a nursery - it's too beautiful to only let baby enjoy! 3. 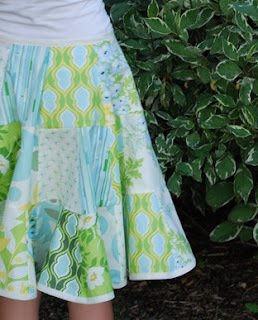 Super cute skirt - I have some great fabric to use on this one. 4. 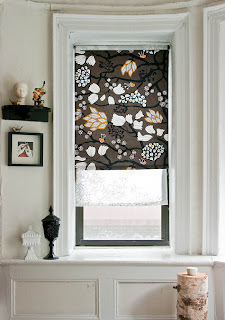 This how to shows a great way to customize a roller shade. Great for a room that you need to black out. Like, oh, my "wake up at dawn" two year old's room perhaps? 5. This is a shower curtain, but I see no reason to use this to make gorgeous curtains for any room of the house. Again, my fabric stash is bursting with possibilities!